The perfect blend of South American and Asian coffees in an espresso pod. 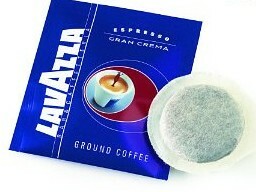 These Lavazza Pods can be used in a Senseo coffee maker. Makes the essential espresso crema too! Rich and intense flavor, full-bodied and balanced. Use with high end espresso machines containing dual pod/ground capabilities, including Nuova Simonelli or Gaggia.